Hand your house over to Interior Designer if you're not confident you can do it... I believe they will create an one and only dream house for you! If you jump into things like I did, due to impatience or penny-pinching, you're almost guaranteed to waste money and time or end up with things you don't really love but can't afford to replace. My wife and I bought our first and current house about four years ago. Not exactly a fixer-upper, the 1951 Ranch needed a cosmetic makeover — paint, new carpet, reclaiming hardwood floors, etc. We also wanted to strip away some of the trim and other trappings of bygone fashions that didn’t fit the spare midcentury aesthetic of the original house. And as with most first-time homeowners, money was not just an object; it was the object. Does any of this sound familiar? The carpentry and other fix-up jobs were no problem for my construction experience, but decorating the empty house (not to mention the landscape) was another matter. Unlike the logical, start-to-finish nature of repair work, decorating is emotional and forever ongoing, and each decision supports, or detracts from, the next. My wife and I fortunately agree on most matters of taste, and if we had loads of cash we would have a field day decorating the house. But decorating on a tight budget is completely different. It’s painfully slow, and it’s fraught with missteps and cheap, “temporary” solutions. Four years into this project we’re far from having a well appointed house, but we’ve learned one invaluable lesson along the way: Design first, then decorate. When I say “design” I’m not talking about generic ideas from a chirpy TV host in a toddler-size T-shirt. Creating your own design plan is all about taking a hard look at your house, thinking carefully about your style preferences, and deciding where you want to go with your home. Don't worry about how much it might cost in the end. The goal at the beginning is to establish your personal vision. What should your main rooms look like when you're done? From there, you can step back and decide how to get there from here. More than anything, a design vision prevents you from common pitfalls, like buying furniture that doesn't really fit your scheme or lifestyle or painting rooms over and over again. When we were preparing our house for moving in, I made a snap decision to buy to coffee table from a friend's parents. We did need a coffee table; we just didn't need that coffee table. It was too big, it wasn't our style at all, and it was glass-topped and we had a three-year-old at the time. It also cost $150. Now it's gathering dust in our storage shed. Mistake #2 was accepting, storing and moving a free 800-pound piano without considering where it would go or whether it could be tuned (it's very old and well-worn). That too is in storage — on our back patio. 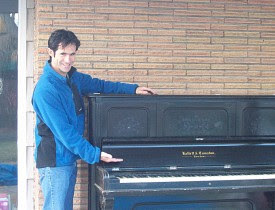 It costs $200 to get rid of a piano. I'm a consummate do-it-yourselfer. I change the oil in our cars, I rent an auger to clear our sewer drain every spring, and I cut my own hair (but not always in that order). In the beginning, there was no way I was going to hire a professional designer to help us with something I could do myself. Then my wife bid on the services of a landscape designer at a fundraiser. This turned out to be the best money we've spent on the house so far. Given the expense, hard work and slow progress of landscaping, I highly recommend working with a local landscape designer to help you devise a comprehensive plan for the outdoors. Another design pro I would likely use is a color consultant (like Kass Wilson of Wallstreat Studios, whose work you can see on Hometalk). For about $100-$150, a color expert will help you choose a paint color scheme for your entire house in one hour. That's less time and money than it takes to buy three cans of good paint. If we ever get around to remodeling our kitchen, I will probably hire a kitchen designer at least for a brainstorming session. The fee for a consultation might be a few hundred bucks, about the cost of one cabinet — a negligible price to pay for knowing you have a good plan on a $5,000+ project. Whether you hire a designer or not, my advice to all new homeowners is to spend the time up front to map out your decorating goals, indoors and out. Of course, there will be some experimentation along the way, and you can always change your mind about specific style choices. But the important thing is to always have a good idea of where you're going with your decorating and other improvements. If you jump into things like I did, due to impatience or penny-pinching, you’re almost guaranteed to waste money and time or end up with things you don't really love but can't afford to replace. Is Your House Ready for Guests?